The Corey name has been in the air compressor industry for over 40 years. Since its humble beginnings in Erie, PA Corey Compressor has grown into a thriving part of this community. Richard Corey started in the air compressor industry working for Bury Compressor Company. This "Big Iron" company helped pave the way for the modern air compressors we see and use today. In 1989 Kevin Corey began working with his father and quickly caught the "air compressor fever". Since starting his work with air compressors, Kevin has worked on everything from high pressure gas compressors, to large rotary air compressors. No matter the make and model of the air compressor, Kevin has been able to conquer any problem that he has come across. In October of 1999 Kevin moved down to SWFL and started what is now known as Corey Compressor, Inc. Since the start of Corey Compressor, Inc. Kevin and the rest of our technicians have been through constant technical training from various air compressor manufacturers. Corey Compressor, Inc. is now a distributor for the largest air compressor company in the world; Atlas Copco. Together with Atlas Copco, Corey Compressor has been able to reach new heights when it comes to technical knowledge and troubleshooting abilities. With their eyes firmly set to the future, the entire Corey Compressor family is determined to continue to set the precedent in quality and honesty in the industry. 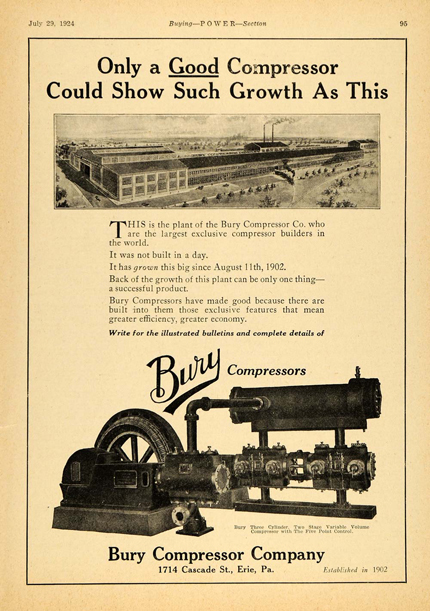 Corey Compressor had its beginnings with the Bury Compressor Company, which was established in 1902.